Grinding out tree stumps with our narrow tree stump grinder (fits through small gates) in Essex, Suffolk and surrounding areas. Free stump removal quote. Call Roy day or night or request a free quote via email. 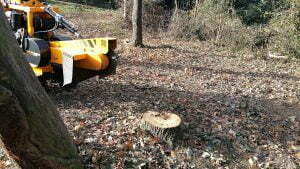 Essex Tree Stump Grinding has been grinding out tree stumps since 2004. Specialising in the removal of tree stumps and tree roots. 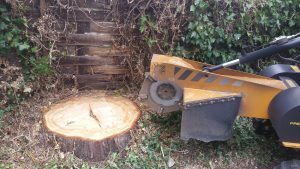 We will remove any size tree stump, however large or small. Based in North West Essex, we cover four counties and the surrounding areas, including Essex, Suffolk, Cambridgeshire and Hertfordshire. Traveling as far as Norfolk! Please call Roy on (07971) 648879 for an instant quote. We offer very competitive quotes with no hidden extras, please call Roy on 07971 648879 for more details. 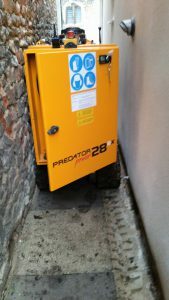 I use a Predator radio remote tracked stump grinder which will fit through most garden gates. The machine narrows down to a minimum of 26 inches (66 cm) which enables it to get into most gardens. However, if your gate is particularly small and sometimes remove the fence panel or coming through a neighbours garden. The predator tracked stump grinder has a very low ground pressure and will cause minimal damage to your lawn, I take extreme care when I am working on other people’s property. You can watch the video below to see the process of grinding out a tree stump. The tree stump is ground down well below ground level and in most cases, the whole tree stump is removed, which leaves you with some fine chip which can then be composted and used at a later date. I work in gardens, building sites, golf courses and for local authorities etc, in fact wherever the offending tree stump maybe. I am fully insured and have comprehensive public liability insurance with the NFU. Thank you for taking the time to write a comment, Lucy, I appreciate it! It was a pleasure to work for you and to get to the root of the problem! I hope that you can complete your fencing project and be nice and tidy for the summer. Roy. Thank you for your question, Alan, I would be very pleased to help you I always take great care and respect when I am on a customers property. The tree stump grinder is on tracks so it is very lightweight when travelling across a lawn and causes minimal damage. These feel free to call me on (07971) 648879 when you are ready. For any of you who are undecided let me quickly sway you. I operated an established tree surgery firm and i hand Roy’s number out to every single customer who enquires, knowing full well that he carries out a superb job going above and beyond. Couldn’t recommend this chap any more. Thank you Martin for taking the time to leave a comment on my website, I do appreciate it and I appreciate you passing work my way. I will also recommend Martin at Falcon Tree Specialists who is a young educated tree surgeon who knows his job and is very enthusiastic about his work! It’s always very encouraging to see young people working hard and doing a good job and keeping customers happy. Thank you for taking the time to comment Jonathan, I really appreciate it. I hope that your garden is coming together now and your plans are coming to fruition. I really appreciate you recommend me, thank you very much. Thank you for your enquiry, I have sent you an email, maybe you could check your spam folder as unfortunately, my emails have a habit of going to people’s spam folder! We had multiple tree stumps removed and where super happy with the job , first time using Roy or any grinding company and would absolutely recommend! No messing on prices or “oh but I’m going to have to charge you extra for this ect “what he quoted was what we paid and was cheaper by some way than another quote we had and his machine got in the garden with a super narrows access . If you’ve found this review you’ve found the right chap for the job ! Roy Bretton on How is the best way to remove a tree stump? Neil on How is the best way to remove a tree stump?